Ever encountered modern day corvettes armed with guns only, no surface-to-air missiles, no anti-ship missiles? No, I am not talking about the Philippine Navy with its armada of end-of-life, end-of-type, hand-me-down vessels where you have Everything-Sans-Missiles. These poor Filipinos, poor in the literal sense, really have no financial means to equip their fleet any better and so have no choice but to make do with donated hardware most of the time. 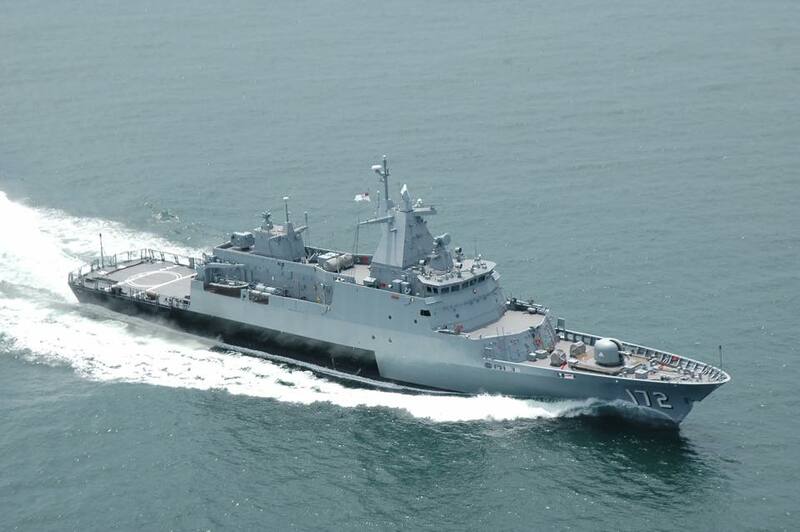 Rather, I am referring to Malaysia's Kedah-class corvettes built under the New Generation Patrol Vessel ( NGPV ) Project initiated in the nineties that had no missile systems installed, seemingly by choice! Strange, you might think, which modern war had been fought without the use of missiles? The world is increasingly gearing towards the use of precision guided munitions and stand-off munitions, half of which would be missiles of some sort, and someone decided to have a guns-only corvette? Incredible, but such strange things do happen in Malaysia. First, some background information. Where In The World Is Malaysia? Malaysia is geographically located in South-East Asia with two land masses of roughly equal size, Peninsula Malaysia and East Malaysia, split apart by the South China Sea. It shares land and sea boarders with Singapore, Thailand, Indonesia, Brunei and the Philippines and is a claimant to some of the islands with disputed ownership in the South China Sea. Peninsula Malaysia is strategically located as it is bound in the west by the Straits of Malacca and faces the South China Sea to the east, both being part of an important international maritime trade route linking Asia Pacific to the Middle-East and Europe where an estimated 5.3 trillion dollars worth of goods are shipped annually and where almost a third of the world's sea-borne crude and half the global LNG would pass through. It has a total land area of 330803km2 and a population of 30 million comprising of a majority bumiputera or indigenous people, largely made up of Malays, and a smaller number of minority ethnic Chinese and Indians. It is rich in natural resources, counting rubber, tin, timber, oil and gas, palm oil as its top exports. Nominal per capita GDP for 2015 is estimated to be about $12127, not among the highest but not exactly poor either. Its economy had been growing at an average rate of 6.5% annually since it gained independence from the British in 1957. Its unit of currency is called the Malaysian Ringgit ( MYR ) and it is currently trading at MYR 4.01 to the Dollar. The annual defence budget for 2016 is about MYR 17.3 billion. Geophysical location of the Federation of Malaysia. The Royal Malaysian Navy ( RMN ) is also known as the Tentera Laut DiRaja Malaysia ( TLDM ) in the Malay language and could trace its origins as far back as the year 1934 to the formation of the Straits Settlement Royal Naval Volunteer Reserve ( SSRNVR ) by the British colonial government in Singapore. Its main objective then was to assist the Royal Navy in the defence of Singapore and Peninsula Malaya against Japanese aggression. During World War II, after the fall of Singapore and Malaya, some of its members continued to serve with the Allied Forces in the Indo-Pacific theatres. The SSRNVR was disbanded after the War ended but were to be reactivated in 1948 during the Malayan Emergency years when communist insurgents fought the colonial government. Then known as the Malayan Naval Force, they operated out of Woodlands Naval Base in Singapore from 1951 onwards. For their exemplary service against the commies, the " Royal Malayan Navy " title was bestowed to the MNF by Queen Elizabeth II not long after her accession in 1952. By 1957, just five years later, Malaya would gain independence from the British and the " Royal " title was still kept but it now referred to the Malayan King, the Yang di-Pertuan Agong, instead of HRH QEII. The post-independence Royal Malayan Navy initially operated assets inherited / transferred from the British, mostly coastal minesweepers and minelayers converted into patrol crafts with an occasional light frigate or two thrown in. In 1963, Malaya, Singapore, North Borneo ( Sabah ) and Sarawak merged to form the Federation of Malaysia. The need to govern large swathe of maritime territories post-merger and the ensuing conflict with Indonesia, known as the Confrontation, due to the latter's objection in creation of Malaysia, would soon force the navy to embark on an unprecedented rapid expansion of capabilities and manpower. Now taking on the new name of the Royal Malaysian Navy ( RMN ) to reflect the name of the newly created Federation, it acquired new equipment, including a large series of 103ft patrol crafts ( PC ) built by Vosper. High speed torpedo boats and bigger fast attack crafts ( FAC ) like the Jerung-class soon followed, and going with the fad of the seventies came the missile gunboats ( FAC-M ) like the Exocet armed Handalan-class and the Perdana-class. The RMN's capabilities were further enhanced when they acquired the Kasturi-class corvettes in the eighties and started the construction of a new major naval base in Lumut. The Laksamana-class corvettes and Lekiu-class frigates were then acquired in the nineties by which time the RMN became one of the better equipped naval force in the region. By 1997, the RMN also ceased all operations from Woodlands Naval Base which they had occupied for more than 45 years, renting it from the Singapore government since 1965 when Singapore was booted out of the Malaysia Federation and gained independence. 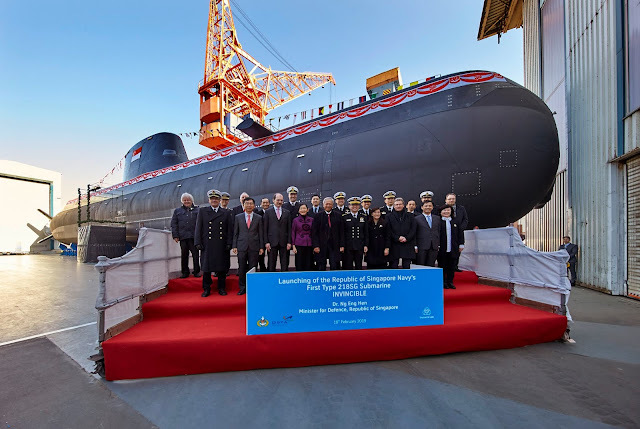 In more recent times, the RMN bought Scorpene-class submarines and continued their efforts of force modernization with the New Generation Patrol Vessel ( NGPV ) project and the Second Generation Patrol Vessel ( SGPV ) project. These new assets are urgently needed as tensions in and around the South China Sea had escalated tremendously in just the past few years as China reiterated its claim on almost the entire South China Sea and adopted highly aggressive and controversial practices including the building of artificial islands. Malaysia's NGPV project was initiated in the early nineties with the objective of replacing the RMN's 18 ageing Sabah-class and Kris-class patrol craft. As mentioned earlier, these Vosper built boats were acquired in the sixties under a very different threat environment and have largely out-lived their usefulness by the turn of the century. They were all tiny, displacing just 96 tons standard and 109 tons fully loaded, with a length of 31m or 103ft. Hence they were also known as the Vosper 103ft Type Patrol Crafts and were hugely popular among small navies during their heyday. Qatar had six while Panama operated two but Malaysia by far had the largest fleet with at least twenty four, all ordered in the early or mid sixties in as many as three tranches. Not only were they small, these PCs were also lightly armed with just two Bofors 40mm guns and perhaps another couple of 12.7mm or 7.62mm machine guns. They were constructed from pre-fabricated welded steel and were powered by two diesel engines which gave a maximum speed of about 25knots. Apart from the engine room, the entire boat is air-conditioned and can accommodate 20 personnel. They have limited range and endurance, said to be 1500nm at 14knots, and were suitable for not much else other than coastal patrols. Normally not venturing beyond 18nm from the coast, these workhorses would eventually be adapted for off-shore work once the 200nm exclusive economic zone ( EEZ ) concept was implemented after the 1982 United Nations Convention on the Law of the Sea ( UNCLOS III ) agreement. The first batch of six Vosper PCs were ordered by the Royal Malayan Navy in 1961. They were built at Vosper's Plymouth yard and all were delivered by 1963 when tensions with Indonesia flared up over the newly created Malaysian Federation. The six PCs were named KD Sri Kedah, KD Sri Selangor, KD Sri Perak, KD Sri Pahang, KD Sri Kelantan and KD Sri Terengganu, after six Malaysian states. The KD prefix adorning all RMN ships is the abbreviation for Kapal DiRaja and could be translated as Ship of His Majesty. 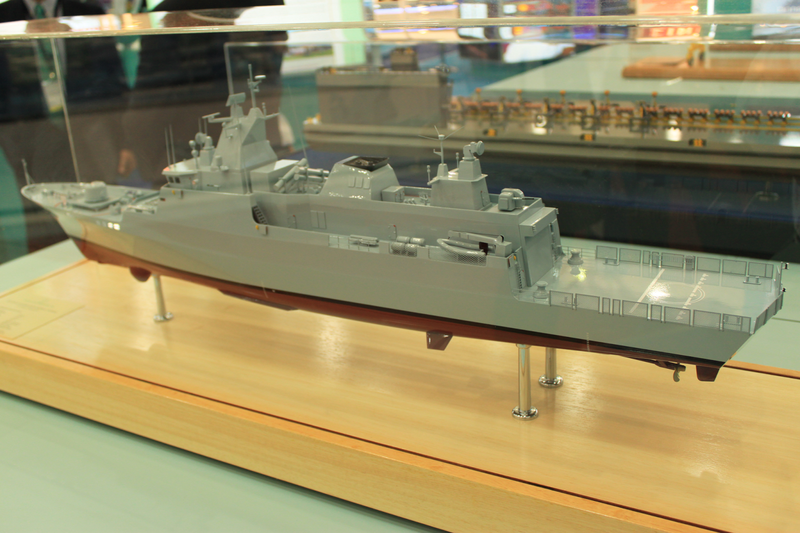 So this first tranche could be called the Kedah-class. They saw extensive action during the Confrontation with Indonesia in their early days but have all been decommissioned or stricken by the mid-nineties. Unfortunately the six new corvettes built under the NGPV project inherited exactly these six names and could easily be confused with the old Kedah-class patrol crafts. The Straits Times 28th May 1963. This was how the first two Vosper PCs were delivered - onboard a cargo ship. officers and ratings flown to the UK. The second batch of four Vosper PCs were ordered probably in 1963 with all deliveries completed by Nov 1964. They were the KD Sri Sabah, KD Sri Sarawak, KD Sri Negri Sembelan and KD Sri Melaka, also referred to as the Sabah-class. They were also named after four other Malaysian states. 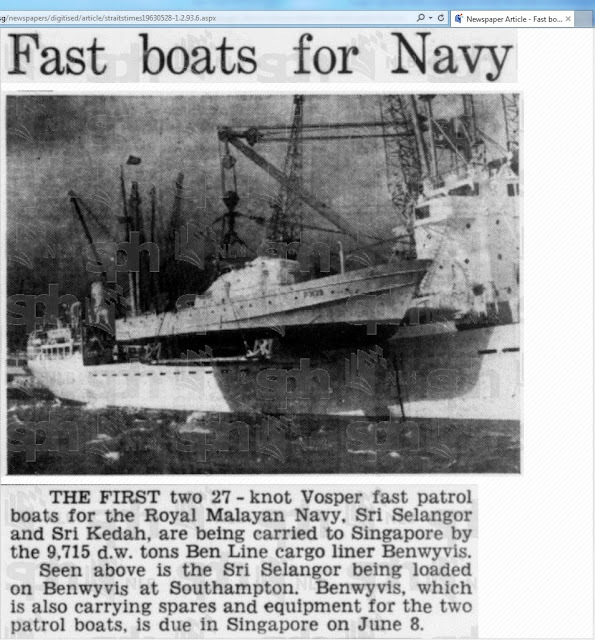 The third tranche of fourteen Vosper PCs were ordered by RMN in 1965 and were all delivered and commissioned by 1968. They differ slightly from the earlier tranches by having more powerful engines and better radar and navigation equipment. These were the Kris-class ( or Keris-class ) PCs. The 4 Sabah-class and the 14 Kris-class PCs remained operational in the RMN for more than four decades until they were decommissioned in 2004 and would be eventually replaced by the new NGPV corvettes starting in 2006. Of the 18 boats, 15 were transferred to the coast guard, the Malaysian Maritime Enforcement Agency ( MMEA ) and were re-named the Sipadan-class. 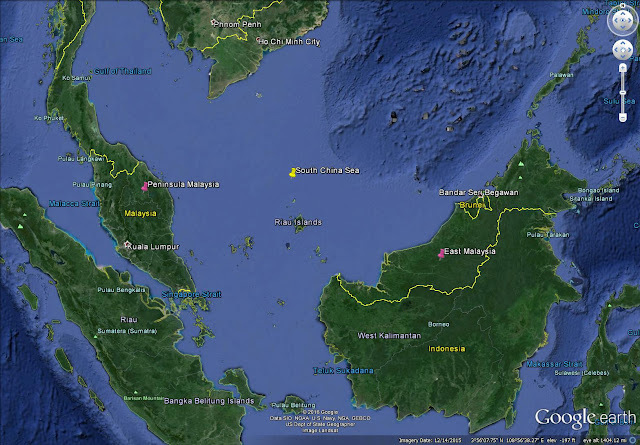 They continue to patrol the waters off East Malaysia and are currently still listed has part of the MMEA's inventory on its website. The Vosper PC's days are already numbered and in 2014 five had been decommissioned by the MMEA and given to the Department of Marine Parks Malaysia to be sunk and used for creating artificial reefs at various locations all over Malaysia. Re-incarnation as the Sipadan-class PC in Malaysian Maritime Enforcement Agency colours. Here's a summary of the RMN's Vosper PC fleet. Some other notable facts about the Vosper PC. On 8th Jan 1984, fresh out of dock from regular maintenance and while in transit from Lumut Naval Base to Labuan Naval Base in Sabah on a training voyage with the frigate F76 KD Hang Tuah and P3143 KD Sri Terengganu, the KD Sri Perak got separated from the group and sprang a leak from the forward hatch during a severe tropical storm in the South China Sea. The flooding was so severe that the ship soon lost all power and therefore radio communications. KD Sri Perak rapidly sank with the lost of 3 crew members. The remaining 26 survivors drifted in a raft for 3 days before being spotted by an AP-3C maritime patrol aircraft and were subsequently rescued. It was the first time a RMN vessel was lost at sea. The ship's captain was subsequently charged for negligence and failure to take appropriate damage control measures. Yet there were allegations that the yard work on the KD Sri Perak was not performed properly and the ship had a defective pump motor and was actually found to be unfit for sea ... the captain merely a scapegoat whose only crime was not to stand firm against the sailing orders, against the authority of the CO of the Fleet Maintenance Unit. After its decommissioning in 1994, the KD Sri Terengganu had been restored by the Naval Dockyard Sdn. Bhd. at a cost of MYR160,000. 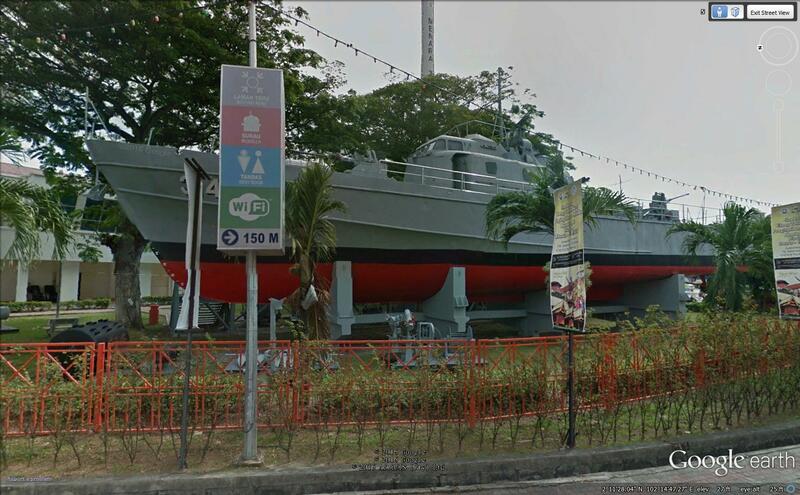 It has been sitting pretty in downtown Melaka as a permanent display at the Naval Museum since 1996. KD Sri Terengganu on display next to the Naval Museum in Melaka. The New Generation Patrol Vessel Project was originally RMN's ambitious undertaking to replace eighteen patrol boats with twenty seven offshore patrol vessels. This requirement probably arose in the early nineties, when the Vosper PCs had already seen continuous service for 25 to 30 years and were nearing the end of their useful life. The initial plans called for a OPV design that is about 80m in length and displacing 1300 tons, a size that is more typically associated with a corvette rather than an OPV. The total cost for the twenty seven ships to be acquired over a fifteen year period was estimated to be MYR24billion or about USD10billion in pre-1997 exchange rates, an obscene amount of money. If implemented in its entirety, it would have been Malaysia's biggest single defence acquisition ever. A competition was carried out in 1996 and with such volumes involved, it was not surprising that many ship builders were vying for the project. The Australians, Germans and the British were all involved with the proposals. By 1997, it emerged that the MEKO 100 design submitted by the German Naval Group ( GNG ) Consortium lead by Blohm + Voss had been selected. It was surprisingly much bigger than expected with a length of 91m and a displacement of 1850 tons! A contract was awarded to GNG and the local ship builder Penang Shipbuilding and Construction-Naval Dockyard Sdn. Bhd. ( PSC-ND ) in 1998 for an initial batch of six ships. The deal would involve the usual technology transfer and technical assistance with the first two hulls being built in Germany and fitted out in Malaysia. The remaining four ships will be built locally with modular kits provided by GNG / Blohm + Voss. All these arrangements looked good on paper but could PSC-ND deliver? PSC Who? PSC-ND has its origins as the RMN's dockyard facilities adjacent to Lumut Naval Base. The naval dockyard has modern facilities to meet the entire maintenance and repair needs of the RMN fleet, anything from hull repairs to major overhauls and refurbishment of combat systems. Under the direction of the Malaysian Government, it was to be corporatised as Limbungan TLDM ( RMN Shipyard ) a wholly-owned government company. This paved the way for its eventual acquisition by public listed company Penang Shipbuilding Corporation ( PSC ) Berhad, and the new entity was called Penang Shipbuilding and Construction-Naval Dockyard ( PSC-ND ). Being appointed the main contractor for the NGPV project should have been an important milestone for PSC-ND, but the project was to be plagued by financial troubles and quality control issues. The first two ships were laid down in Nov and Dec 2001 and were launched in Mar and Oct 2003 respectively. They were supposed to be fitted out in Malaysia and soon it would emerge that the delivery date line for the first two NGPVs could not be met. The first hull could not even pass pre-delivery sea trials due to technical problems. But somehow, penalties for delays and late delivery were waived by the Malaysian Government!!? Where is the incentive to deliver on time if you know the penalties could be avoided? PSC-ND clearly had good connections at high places. Further investigations uncovered serious corporate governance issues, financial mismanagement and corruption within PSC-ND. The chairman and director of PSC-ND Amin Shah was found to have been absent from many meetings of the board of directors. Some 40 sub-contractors involved in the NGPV project have been owed a total of MYR180million. PSC-ND also failed to remit up to MYR4million on behalf of its employees to the Employee's Provident Fund, despite having deducted the amount from their salaries .... . The entire project stalled and the Public Accounts Committee believed that an additional MYR120million had to be injected by the government to salvage the first two hulls and MYR80million more to pay off local vendors, sub-contractors and service providers. It had also been alleged that PSC-ND sort a further advancement of MYR1.8billion from the Malaysian Government to complete the project. Somebody did the calculations wrongly? Someone did not pay attention in mathematics class in school? More likely just rampant corruption! Faced with such incredible and unprecedented incompetency, the Malaysian Government bowed to public pressure and intervened, forcing a complete revamp of PSC-ND. Another government linked company, Boustead Holdings Berhad, took up a large stake of PSC Industries ( PSCI ) Berhad, the parent company of PSC. The troubled PSC-ND, being a division of PSC, was then absorbed into Boustead Holding's heavy industries arm and became Boustead Naval Shipyard Sdn. Bhd. With a complete change in the management, the NGPV project was revived and the first two OPV / corvettes were finally commissioned in 2006. Amin Shah, the millionaire entrepreneur linked to PSCI was eventually ousted as chairman and director of PSC-ND and made a bankrupt but never convicted of any wrong doings. Convicting him would probably implicate way tooooo many admirals and politicians as well, so its best to let sleeping dogs lie. He is said to have a vast business empire all over the world and had left the country after the scandal unfolded. Some Malaysian netizens even openly blame him for single-handedly causing the " downfall " of the RMN. From Twenty Seven to Six! The NGPV scandal not only delayed the completion of the first six ships, it also cost the RMN the subsequent twenty one ships and dashed its dream of becoming the naval power house of South East Asia as the Malaysian Government had been discouraged to make any further investments in the entire class of OPVs and cancelled the programme. 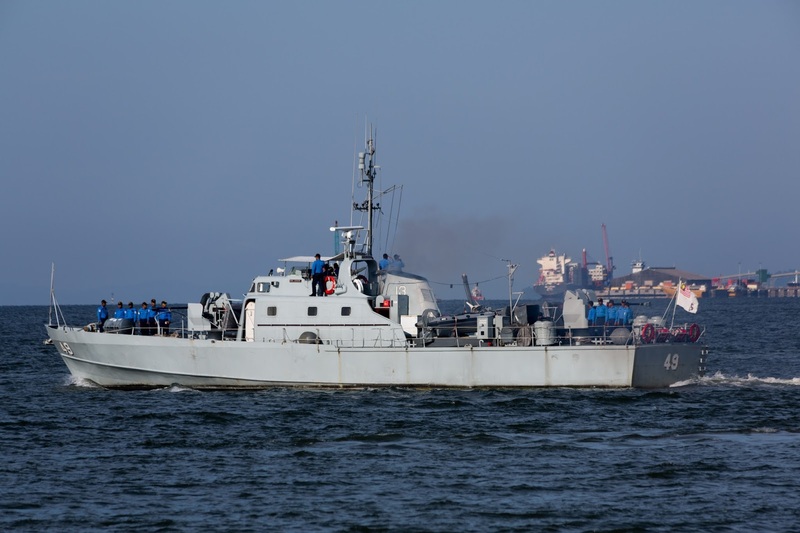 However, the real situation might not have been so bleak if we take into account the follow-on project known as the Second Generation Patrol Vessel ( SGPV ) Project which was initiated not long after the conclusion of the NGPV Project. Had it not been for the early termination of the NGPV project, the RMN might not have the resources, budget or justification to push for the SGPV project which is supposed to give the RMN six stealth frigates. So maybe not as drastic a reduction in numbers as twenty seven to six but rather twenty seven to six plus six. But what is the MEKO 100 design and what is the NGPV? Is it a corvette or an offshore patrol vessel? The name MEKO is a trade mark and comes from the German word Mehrzweck-Kombination which means multi-purpose combination. It refers to the German ship builder Blohm+Voss' family of vessels which are highly scalable due to their modular designs. 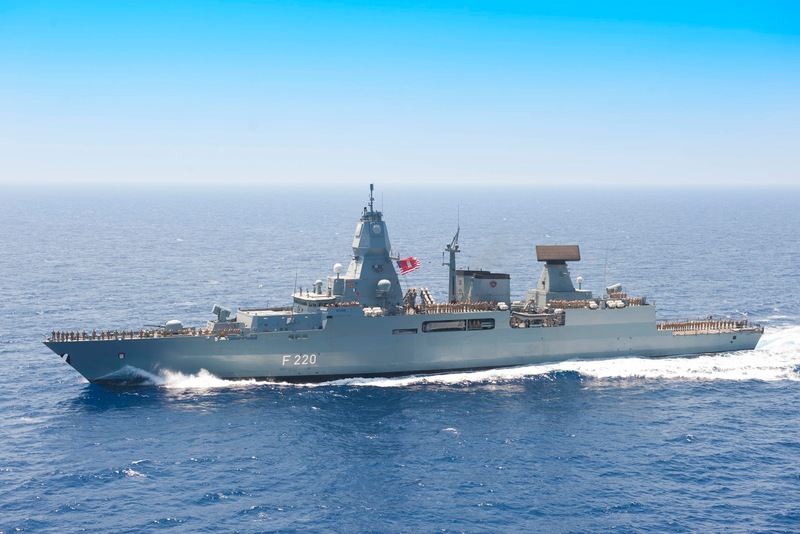 Depending on the perceived threat environment, the customer can have a choice of vessel size ranging from a small OPV to large frigates or even small destroyers. The combat sub-systems can also be customized according to needs and budget. Since the late seventies, the MEKO design has been equipping many navies around the world. Some of the notable ones include Australia and New Zealand's ANZAC-class frigate based on the MEKO 200 design, Germany's F123 Brandenburg-class and F124 Sachsen-class frigates and K130 Braunschweig-class corvettes and of course Malaysia's Kedah-class OPV based on the MEKO 100 design. All the MEKO ships are characterized by reduced signatures, especially that of radar cross-section and infra-red but also acoustic and magnetic. The funnel or smoke stack is deleted and all engine exhaust is expelled horizontally on or below the waterline, selectable depending on the threat. The mono-hull design incorporates a forefoot skeg for yaw control and has active fin stabilisers allowing for high speeds, quietness and good sea keeping. Helicopter and ship operations can be carried out up to sea state 6. Some even have unique adaptations or solutions, like the all UAV hangars of the K130 corvettes that accommodate 2 drones. Malaysia's six NGPVs inherited the names of the first six Vosper PCs ordered in 1961 and long since retired or decommissioned. An oddity is that the " Sri " prefix that is only used in combination with the name of a Malaysian state has been omitted in the new series of ships. So instead of KD Sri Kedah, the lead ship is simply called KD Kedah, and the entire class is therefore also known as the Kedah-class. Whether they are OPVs or corvettes probably depends on your point of view. ThyssenKrupp Marine Systems ( TKMS ), parent company of Blohm+Voss, listed Malaysia's NGPV as the Blohm+Voss MEKO 100PV ( 2003 ) under the corvette category on its website. Jane's IHS 360 referred to the NGPVs as corvettes in their routine news coverage on the Kedah-class. The US Navy's official photo gallery even labeled them as FFL or light frigate ( see topmost photo ), a designation seldom seen used on modern frigates nowadays as almost all are FFG or guided missile frigates. The RMN classifies them as OPV and perhaps rightly so if based on their lack of long range anti-air and anti-ship armaments but their pennant numbers tell a different story! The Kedah-class ships have pennant numbers F171 to F176 and based on the international pennant number system adopted by many NATO and Commonwealth countries including Malaysia, the F prefix indicates a frigate or corvette hull type! 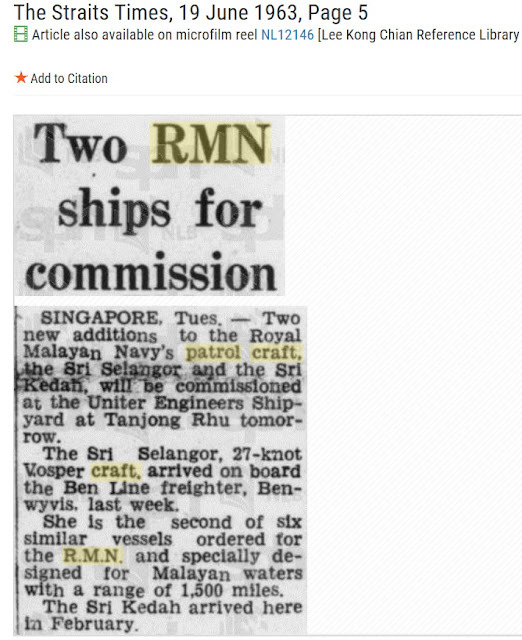 So there is ambiguity even within the RMN as to the real status of these vessels. Personally, I am more inclined to view them as corvettes based on their relatively large displacement of close to 2000 tons, corvettes without much teeth that is. Sonar : L-3 ELAC Nautik NDS-3060 obstacle avoidance sonar. To understand why the Kedah-class were commissioned without advanced weaponry, we must ask ourselves this question : how can a country like Malaysia with a GDP ranking of number 33 in the world afford to buy twenty seven corvettes just like that. Or to put it another way, how would a shipbuilder convince its prospective client that he can afford a sizable fleet? The answer lies with a concept known as " fitted for but not with ", a method of building ships with plug and play modularity where vessels are constructed ready to receive expensive combat subsystems in the future. So everything required for the future installation of whatever weapon, sensor or defensive system intended would have been thought of and catered for, like allocating of the physical space, the load factor, the power requirements and the electrical hard wirings, network integration into the existing command and control system / combat system etc. 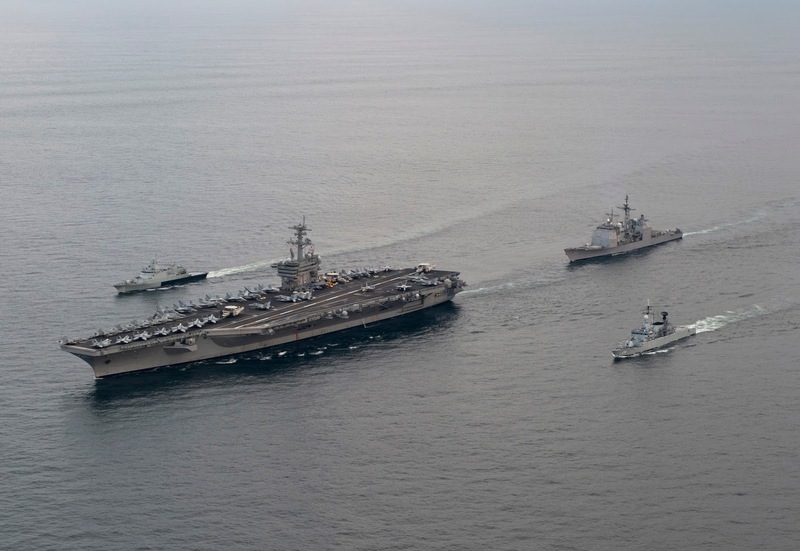 Such practices are adopted to largely keep built costs down for new vessels as modern weapons subsystems can be extremely expensive to procure and maintain and can form a large portion of the total acquisition cost. They can also be seen as future-proofing a vessel type. Capabilities can then be added anytime when the budget allows or when the threat environment justifies. A good example would be the ten ANZAC-class frigates of the Australian and New Zealand Navies, incidentally based on the MEKO 200 design. 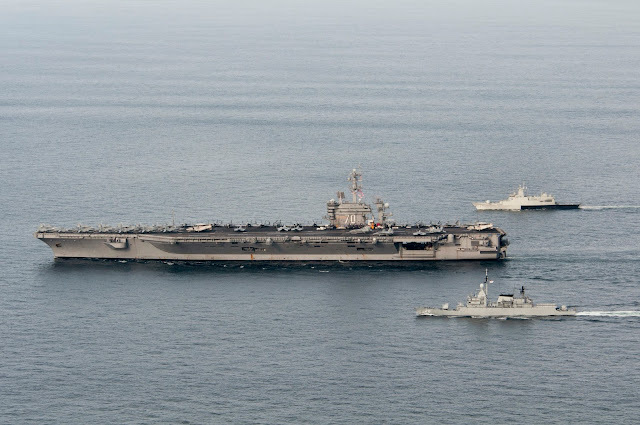 They were fitted for but not with close-in weapon system ( CIWS ), Harpoon anti-ship missiles ( SSM ), a second set of Mk41 vertical launch system ( VLS ) and a towed array system for anti-submarine warfare. The first in class HMAS Anzac was commissioned in 1996. 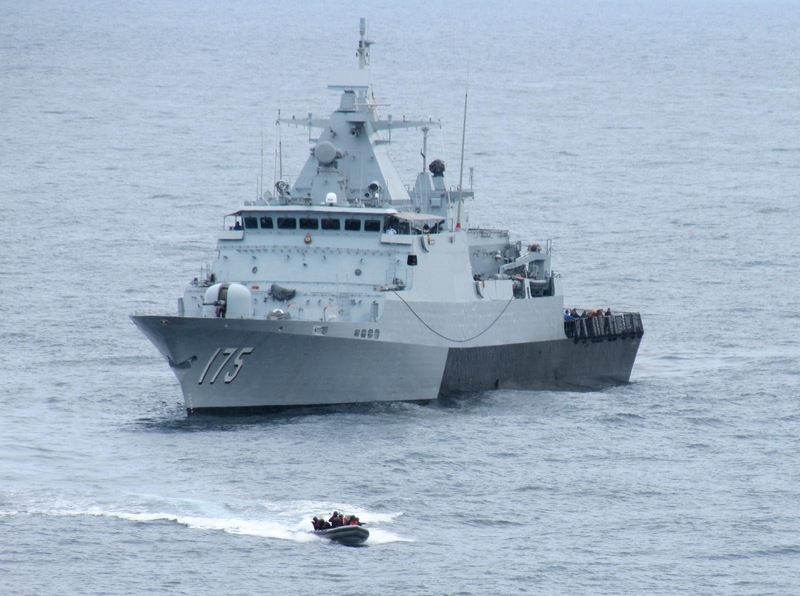 As the last ship of the class entered service in 2006, both the Royal Australian Navy and the Royal New Zealand Navy had embarked on upgrade programmes for their frigates. By adopting this concept, Blohm+Voss omitted the MM40 Block II Exocet SSM and the RIM-116 Rolling Airframe Missile, kept projected costs down and clinched the deal to build the NGPVs. That was how the Kedah-class was constructed with guns only, no CIWS and no missiles. 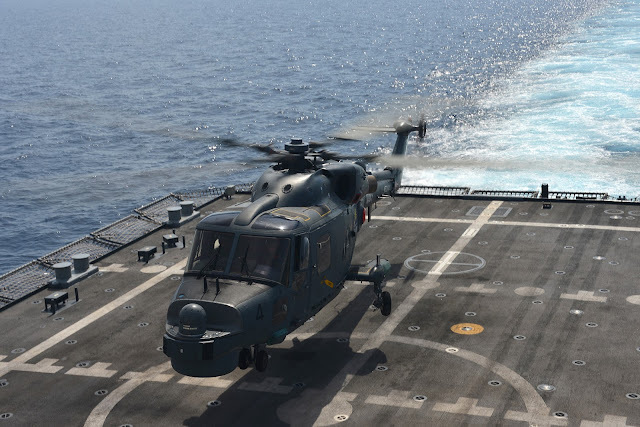 In addition, although equipped with a stern hanger and capable of embarking a medium helicopter like RMN's existing Super Lynx 300 ASW helicopter, no additional helicopter assets were bought with the arrival of the Kedah-class into the fleet. But really, is this fitted for but not with idea for the NGPV a good move for the RMN? Would you rather have a large number of low capability assets or would you be better off with a much smaller number of highly capable ones? I would choose the latter option as one would never be certain about promised upgrades in the future. Mindsets could change and allocated budgets could disappear as economic and political situations evolve over time. So I say live within your means and settle for complete systems commensurate with existing requirements and let the future worry for itself. Dude, I'm Gonna Get Me Them Missiles, No? Dude may sound too American. May be it should be " Bang, am I getting my missiles or not? ". Bang as in Abang, means brother in Malay. Even as we speak, the Kedah-class NGPV, as of everything else, continue to age. In the blink of an eye, the first and second of class KD Kedah and KD Pahang had already been commissioned for, gasp, ten years. Yet as a class they remained in their original fitted for but not with configuration, as other seemingly more urgent priorities set in, like the construction of the SGPVs and the upgrade of the Scorpene submarines. Will the Kedah-class be getting any upgrades at all given that the MYR9billion SGPV project alone would have taken a huge chunk of the annual defence budget for the foreseeable few years. What would be left for the Kedah-class? Also, since Malaysia's economy is closely linked to oil production, with oil prices at rock bottom currently, the future does not look bright for the NGPVs. The longer it takes to implement any upgrades, the less meaningful and useful they become, the less value they add to the fleet. This is because all hulls have a useful life of about thirty years, more or less, depending on how they are used and cared for. With about a third of their service life gone, anyone can understand that whatever planned upgrades should have been carried out as soon as possible. 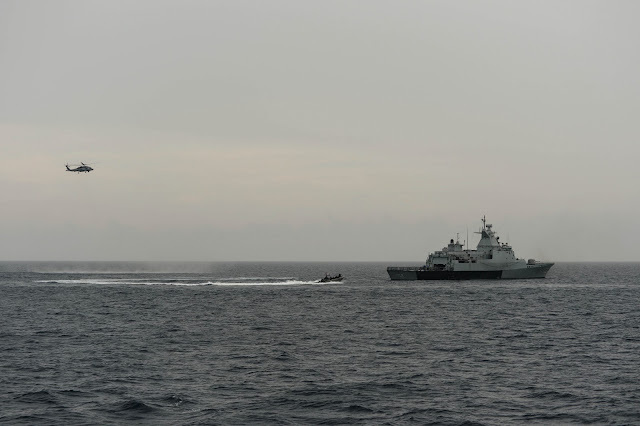 At the annual OPV and Corvettes Asia Pacific conference in Singapore in 2015, the RMN actually announced plans to carry out upgrades to two NGPVs for anti-surface warfare ( ASuW ) and the other four for anti-submarine warfare ( ASW ). The ASuW upgrade package would include surface-to-surface missiles, surface-to-air missiles and organic naval helicopter. The ASW package will have towed array and hull-mounted sonar, torpedo launchers and dedicated ASW helicopters. No further details were available on specific systems, or specific ships for specific roles, and all plans were pending approval and funding. So the upgrades are not yet a done deal. Earlier that same year, the RMN also said that it had requested for funding for 36 programmes under the 11th Malaysia Plan covering the period 2016 - 2020. The Malaysia Plan is five year government funding allocation event. 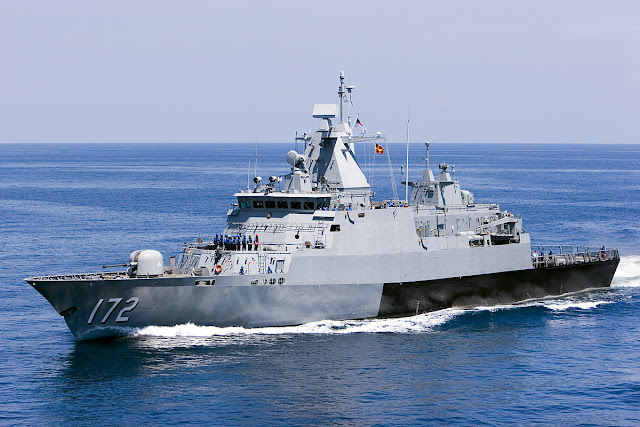 The request which would include plans to upgrade the Kedah-class OPV and the Laksamana-class corvettes would cost MYR10.1billion or USD2.8billion. What is the Kedah-class good for? Good sized corvette type hull, open ocean capable, decent combat systems and electronic systems, decent guns but no CIWS, no SSM, no SAM, no torpedoes, no ASW sonar? That's essentially an over-sized gunboat! It could be part of a surface action group but can never be able to operate independently especially in a high threat environment without some sort of air cover. It could be a great training platform for seamen and midshipmen, but now many training vessels does a small navy require? Besides, the RMN is already building two Samudera-class training ships due to be completed this year after being long delayed by ..... another scandal! Sigh. With its helideck and hangar and good range it might do well in search and rescue operations ( SAR ), and humanitarian and disaster relief operations ( HADR ). 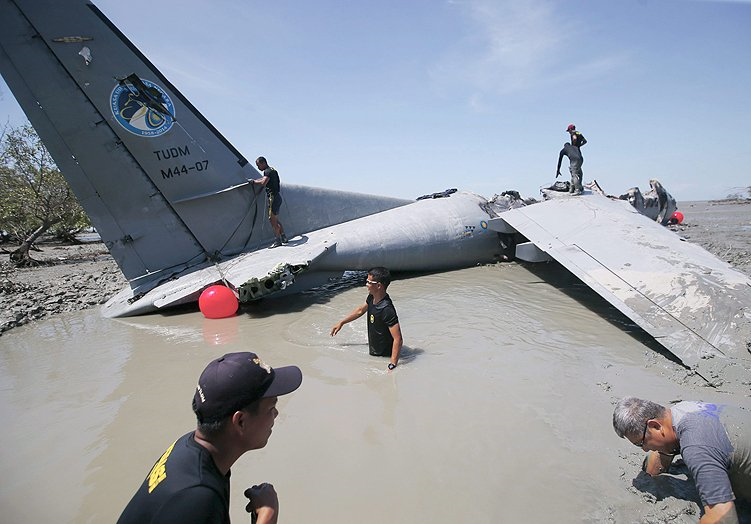 But how frequent does major disaster strike unless you are Malaysian Airlines or the Royal Malaysian Air Farce with Nuris ( Sikorsky S-61 aka SH-3 Sea King ) and CN-235 dropping out of the sky like flies??! With the ability to launch boats and accommodate additional personnel which may include special forces and anti-terror specialists, it might also do very well in maritime security and anti-piracy operations where sometimes presence is all you need for deterrence, no need for SSMs, torpedoes or SAMs or any other high tech weaponry. Apart from Somalia, we know that the Straits of Malacca between Sumatra and the west coast of Peninsula Malaysia is the other hotbed for pirates. 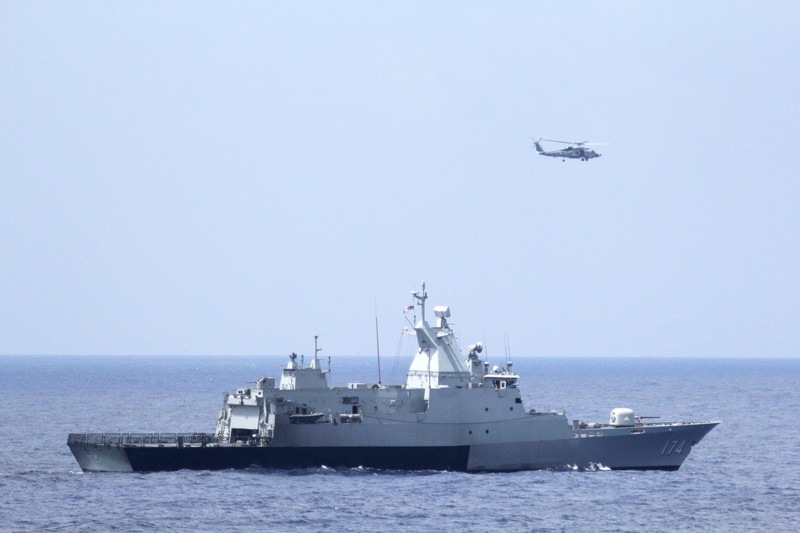 SAR : The KD Terengganu during the search for Flight MH370 in 2014. As above but with Ticonderoga-class Aegis cruiser CG-52 USS Bunker Hill trailing behind. along the Kuala Selangor coastline. Fortunately, no lives were lost. But hang on a second, SAR, HADR, anti-piracy ops or just patrolling, aren't these primarily COAST GUARD duties??! Now of course these functions can be performed by any major surface combatant as well but certainly not as their core mission. So yes these sheep in wolf's clothing would do very well as coast guard cutters to patrol Malaysia's vast EEZ. At least now we can say they are not simply good for nothing. Just last month on 24th Mar 2016, the MMEA reported that it detected and was monitoring one hundred Chinese fishing vessels escorted by two Chinese Coast Guard ships encroaching Malaysian waters around the South Luconia Shoals in the South China Sea near the town of Miri in Sarawak, East Malaysia. The RMN however, initially denied that the Chinese vessels were found in Malaysian waters, only to reverse their stance later. The confusion caused a delay in the Ministry of Foreign Affair's official respond to China, who of course denied that there was ever a problem. China claimed that it was the annual fishing season in the South China Sea and that its fishermen were merely fishing in their " traditional fishing grounds " which their ancestors had fished since the days of yond. 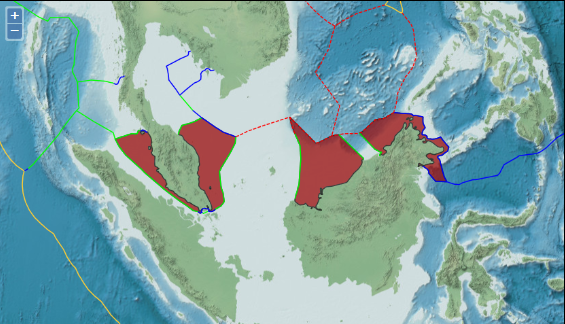 Faced with such absurd logic and unreasonable behavior from a major regional power and aspiring world power like China, Malaysia really needed bigger and better platforms for its coast guard, the MMEA. 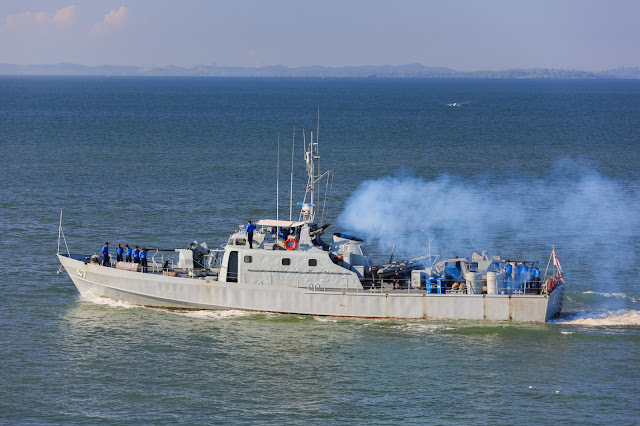 Unless the Kedah-class gets upgraded and soon, they might end up with the same fate as their predecessors, the Vosper PCs, that of being transferred from the RMN to the MMEA for EEZ patrol duties. The saddest thing about the NGPV project was the lost potential for this class as a whole. What if the RMN had stayed true with the original 80m, 1300 ton proposal. Would the funds then be available to equip them better. Would the construction process be technically less demanding therefore resulting in on time delivery? Could it have resulted in the eventual construction of all twenty seven of the planned vessels? Did the ship builders hoodwink the RMN to cut back on the equipping to buy vessels bigger than they originally intended and actually required? At around USD300million apiece, these supersized gunboats are not exactly cheap. South African Navy's four Valour-class MEKO A200 type guided missile frigates each displacing 3700 tons and armed to the teeth were ordered around the same time as the NGPV, just a couple of years earlier in 1999. They cost "only" USD327million each, marginally more than RMN's super cutter. This leads us to another issue. What the heck did the Malaysians pay for that the South Africans didn't have to? Could the cost of technology transfer and local construction inflate the price of the vessels by such a degree? Noooooo ... I do not think so. As usual, in this scandal filled country, every single venture, big or small, government or private, is a golden opportunity for someone, usually of high social standing and with good connections, to generate a handsome profit for himself or his cronies. The NGPV project is probably no exception and was not spared from multiple levels of fleecing. 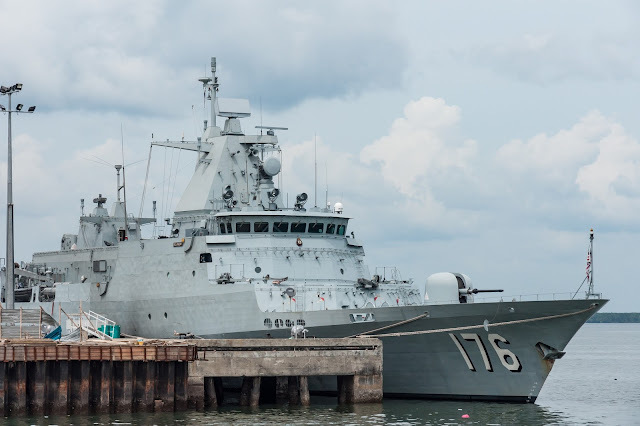 Only the Malaysian authorities have the great talent to convert a frigate to a cutter and still appear to look innocent in the eyes of its ordinary citizens, but of course we know better. At the end of the day, unless you happened to be a Malaysian taxpayer, Does It Really Matter? Tukar kerajaan Malaysia kepada PAS, pasti kelengkapan ketenteraan Malaysia akan jauh lebih baik kerana tahap rasuah hampir 0.0%. Sama juga. Mana-mana parti ada saja yang rasuahnya. Kes sama, cuma wajah berbeza. I know that Defence projects all become the victim of mission creep. I have a love for Malaysia, it is sad when you read about the scandals that have become biasa. KABAYAN Supernova! Good blog and article on RMN. Why are you so obsessed with our RMN? Got an article on your navy? Supernova. You can't be from other ASEAN country except the Philippines. 🤔 Superb blog.